Four years ago, when Jeslin Kera toured the UCF College of Medicine as an aspiring student, she dreamed of seeing her face in one of the class portraits hanging in the medical education building. So Monday, as Kera watched UCF President Dale Whittaker unveil the official portrait of the Class of 2022, — her face among the 120 future physicians in the med school’s 10th class — she felt the realization of a dream. The official class portrait is taken at the White Coat Ceremony, when first-year students are welcomed to medical school as colleagues in healthcare. 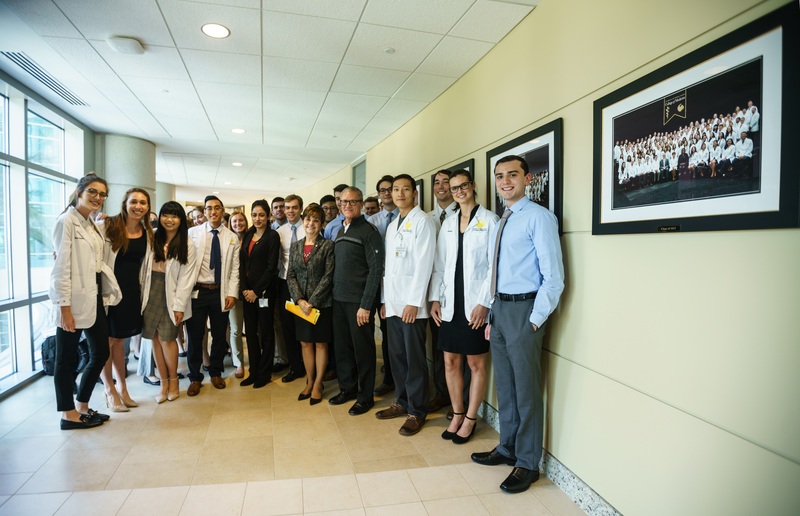 Since the College of Medicine’s Charter Class enrolled in 2009, nine class photos have been hung on the second floor outside the Harriet F. Ginsburg Health Sciences Library. The designated wall had space for 10 framed portraits. Dr. Deborah German, vice president for health affairs and dean, said every day she walked past the wall, she dreamed of seeing it filled with class portraits. On Monday, the 10th portrait was hung in a brief ceremony attended by Whittaker, UCF vice presidents and Class of 2022 students. German said the occasion was a milestone for many reasons. To resounding applause from the students, Whittaker and German pulled the draping from the class picture. Once the formalities were over, students excitedly took turns snapping pictures of the portrait with their cellphones. Read more about the Class of 2022 here.